It took only two jumps for Jarvis Gotch to go from aspiring medalist to a 22nd-place finish at the NCAA Outdoor Track and Field Championships in Eugene, Oregon last June. Gotch, a redshirt junior at Louisiana Tech, entered with the fifth-best mark in the country before plummeting 17 spots after two failed attempts. Seven months later, and now in his first Division I season as an indoor jumper, Gotch set the world leading long jump of the season with 26’-73/4” the weekend of January 24 at the Vanderbilt Indoor Invitational. He became the first jumper from a non-Power-5 school to surpass eight meters (26’-3”) since 2010. The jump over shot his previous record by five inches, which he set January 17 at Texas A&M. Gotch, competing in just his third indoor meet, shattered the previous school record of 25’-11” set by Wesley Smith in 1973 in the process. The former star at South Plains Community College beat his personal best by more than a foot. His mark of 25’-41/2” earned him a spot in nationals before a 22-101/4” resulted in the 22nd-place finish. “My recipe is just bringing a lot of speed down the runway, generating a lot of power through the board and finishing a great jump,” said Gotch, who has also competed in the 55-m dash, 100m dash and 400m relay at Louisiana Tech. 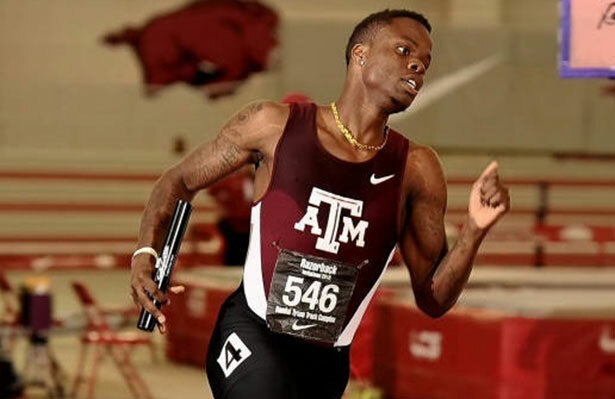 Texas A&M men clocked 3:03.23 to win the 4×400 relay at the Razorback Invitational, Randal Tyson Track Center in Fayetteville over the January 30 weekend, just short of the 3:03.20 collegiate record that they set on their home track during the 2014 SEC Championships. The 3:03.23 is the second fastest collegiate time in history and the world-leading mark for 2015. It is also the eighth fastest performance on the all-time world list and the fastest 4×400 ever recorded in the month of January. The Aggie squad consisted of Gregory Coleman (47.15), Bralon Taplin (44.78), Shavez Hart (46.17) and Deon Lendore (45.13) in that order. The competition in the race was well back with Notre Dame (3:09.90) and Purdue (3:09.97) placing second and third. LSU was an early challenger, but faded to a 3:16.69 fifth place finish. The victory placed the Aggies within two points of winning the meet. Arkansas scored 85.5 points to hold off SEC rivals Florida (85), Texas A&M (84), and LSU (81.5). The rest of the field included Oklahoma (70), Purdue (52), Stanford (46.5), Iowa State (43), Oklahoma State (38), Tulsa (38), Notre Dame (21.5) and Florida State (10). In the women’s team chase the Razorbacks won with 111 points over the SEC crew of Florida (84), LSU (81), and Texas A&M (70). The remainder of the field included Iowa State (51), Stanford (48), Purdue (43), Notre Dame (43), Oklahoma (35), Oklahoma State (34), Tulsa (13) and Florida State (6). The collegiate record in the women’s pole vault was broken yet again on Saturday (Jan. 24) afternoon in New Mexico, when Stephen F. Austin’s Demi Payne cleared 4.75 meters (15’-7”) to erase the 4.63m (15’-2¼”) record she set the week before. She broke it twice, clearing 4.65m (15’-3”) on the way. The Albuquerque Convention Center where Payne competed this last Saturday has previously yielded several outstanding vaults. Petrillose set her record there in 2014, a mark that is 10cm (4”) higher than any other of her career; Jen Suhr set her indoor World Record there two years ago, which is also 10cm higher than anything else she did; and Kylie Hutson and Mary Saxer’s career indoor/outdoor PRs were set there also. The vault is the world lead and ties Payne at #3 on the all-time US lists. After clocking back-to-back personal bests in winning her first collegiate title in the 60m hurdles at Arkansas’ Razorback Invitational on Saturday, Lady Tiger rookie Daeshon Gordon was honored Tuesday by the Southeastern Conference as the SEC Women’s Freshman of the Week as one of the league’s top performers. Gordon put herself in qualifying position for the NCAA Division I Indoor Track & Field Championships with her personal-best performance at the Randal Tyson Track Center in Fayetteville. After qualifying as the top Lady Tiger in the first round on Friday night with a time of 8.53secs, Gordon raced to back-to-back personal bests on Saturday with times of 8.40 to win her semifinal race with the second-fastest time of the round and 8.30 in the final to edge the likes of Purdue’s Devynne Charlton (8.31) and Notre Dame’s Jade Barber (8.32) at the tape for the victory. Charlton entered the meet ranked among the NCAA’s Top 10 hurdlers as the No. 8-ranked performer in 2015, while Barber was among the NCAA’s Top 20 performers at No. 18 nationally for this indoor season. While entering the meet with her previous personal best of 8.50 set in back-to-back meets at the LSU Indoor Invitational and Auburn Indoor Invitational to kick off the season, Gordon dropped her best by two tenths of a second for her performance on Saturday as she also emerged as the NCAA’s No. 14-ranked 60m hurdler among all classifications during the 2015 indoor season. She is also now the second-fastest freshman in the country and the No. 7-ranked hurdler in the SEC rankings for her efforts.